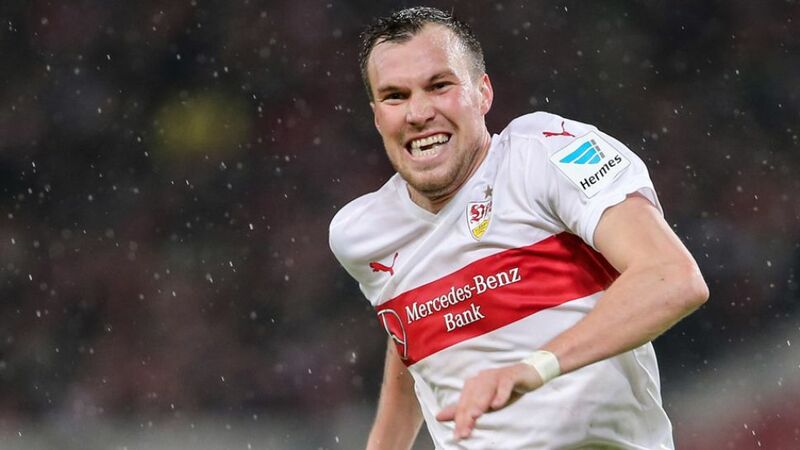 He may have only joined the club during the winter break but Kevin Großkreutz has already left a powerful impression at VfB Stuttgart. The inclusion of the 2014 FIFA World Cup-winner in the team has coincided with two wins in two for VfB to kick off 2016, and there is growing belief that the southwest club - now - can continue their recent improvement to pull further away from the drop zone. Großkreutz himself, meanwhile, could not be more pleased with his successful return to first-team football following an ill-fated six-month spell with Galatasaray SK. Speaking to the media after Matchday 19’s come-from-behind 2-1 win against Hamburger SV, the 27-year-old spoke about settling into his new club and his hopes for the rest of the season. Kevin Großkreutz, since you’ve joined Stuttgart, things seem to be going perfectly. Do we put that down to you? Großkreutz: (Laughs) Not, it’s not just down to me. This team just has massive potential. We’re doing our thing together at the moment and it’s paying off. Stuttgart look a different team from a few matches ago. Why do you think that is? Großkreutz: We’re just a team – on the pitch and off it. We give everything for each other and we creating lots and lots of chances. Sooner or later, we get our rewards. What part has the new coach Jürgen Kramny played in this turnaround? What do you make of him? Großkreutz: Kramny is a great coach and he improves every player. He says the right things and that really helps the team. After a difficult six months or so, how much fun is it for you to be playing regularly? Großkreutz: I’m the happiest man around right now and I’m just delighted to be out on the pitch. We’re playing well right now and we hope it continues. You’re one of the form teams at present. What can Stuttgart achieve? Großkreutz: The first thing we have to do is get away from the bottom of the table. We have Eintracht Frankfurt away next week and that will be another relegation scrap that we’ll have to stand up to. We’ll carry on working and then we’ll get start climbing the league. As someone born and bred in Dortmund, how have you settled in Stuttgart? Großkreutz: I really feel at home here. The whole club has given me a great welcome and we have a lot of fun with each other. We laugh a lot and that’s the most important thing. How is your fitness coming along? Großkreutz: My legs, my lungs – everything’s co-operating so far. I feel really good. The thing I’d like most now is an Englischer Woche. So everything is going perfectly at VfB Stuttgart? Großkreutz: The team is working well and the coach says the right things and motivates us all. We’re ploughing through and that’s how it needs to stay. There was one moment of concern in this game: the chance you missed to make it 1-0. That would have set you on your way, no? Großkreutz: Ah well, you know… I knew we were going to win 2-1 anyway (laughs).